Are you searching for honeymoon cabins in Gatlinburg, TN for a romantic getaway? Or maybe you are planning a Smoky Mountain wedding and need a honeymoon cabin in Gatlinburg? 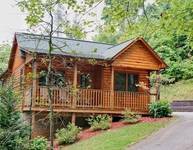 Find the list of 1 bedroom honeymoon cabin rentals in Gatlinburg and Pigeon Forge Tennessee offered by Heartland Cabin Rentals in the Great Smoky Mountains below. Browse our list of our honeymoon cabins in Gatlinburg. All of our cabins have full kitchens and hot tubs. Make Heartland Cabin Rentals an annual tradition for your anniversaries for years to come! Nothing says romantic like waking up and looking out over a panoramic view of the mountains. That is exactly what you will get at this 1 bedroom cabin Bear Pause. Conveniently located between Gatlinburg and Pigeon Forge. This cabin is a cozy mountain... THIS CABIN IS NOT PET OR SMOKE FRIENDLY! 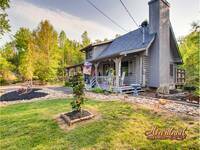 This quaint studio cabin is located in the heart of the Arts and Crafts Community of Gatlinburg. The cabin will sit in a wooded area with a small stream in the front yard. The charcoal grill and picnic table is perfect for enjoying a dinner in the outdoors. If you are looking for 1 Bedroom Cabins in Gatlinburg or a Pigeon Forge Cabin. Then look at Afternoon Delight.This private and cozy log cabin is situated high on a mountain top between Gatlinburg and Pigeon Forge and is bordered by the Smoky Mountains National Park. Featured in the Master Suite are barn loft windows... THIS CABIN IS NOT PET OR SMOKE FRIENDLY! Cozy Mountain Hideaway, a one bedroom Gatlinburg cabin, is your perfect getaway for a honeymoon, anniversary or weekend getaway. Tucked away in the wooded area, the hot tub invites you to sit and relax after a day of hiking or enjoying Gatlinburg or Pigeon Forge. Cozy and secure, this 1 bedroom cabin in Gatlinburg is perfect for a quiet mountain getaway. Sweeping views and a warm fire to snuggle by! Located off of the bedroom is a private sitting area, perfect for relaxation. Hot Tub, fooseball and Beautiful Mountain Views! Country Hideaway is a 2 bedroom log cabin with a loft near Dollywood in Pigeon Forge, TN. King size bedroom with full bath, TV and French doors open to deck where Hot Tub is awaits you for soaking and relaxing is located on the main floor... THIS CABIN IS NOT PET OR SMOKE FRIENDLY! Sugar Shack is perfect for a honeymoon or romantic getaway. 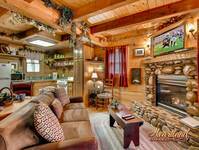 This cabin in Gatlinburg offers a hot tub, jacuzzi tub, gas fireplace and much more! Cuddlers Paradise is a beautiful 1 bedroom Gatlinburg cabin with Hot Tub, Jacuzzi and Air Hockey table located in a beautiful wooded area.